The leading provider of prepaid mobile services, Virgin Mobile USA has launched the new Broadband2Go Novatel Wireless MiFi 2200 Intelligent Mobile Hotspot, which the company claims as the industry’s first prepaid Intelligent Mobile Hotspot that eliminates the needs for an annual contract, monthly subscription as well as activation fee, capable of supporting up to 4 hours of usage time or 40 hours of standby time with a single charge. 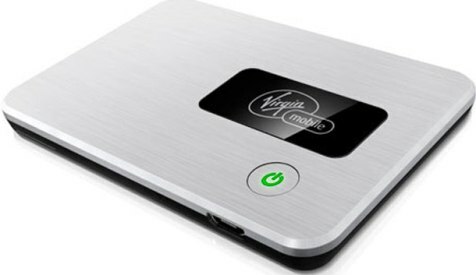 The easy-to-use Virgin Mobile MiFi 2200 creates a 3G mobile hotspot that able to connect up to five Wi-Fi enabled devices to prepaid wireless Internet service, allowing the users to stay connected while at home or on-the-move. Novatel Wireless (Virgin Mobile) MiFi 2200 Intelligent Mobile Hotspot which measures 3.50 x 2.32 x 0.35 inches and weights just 2.05 ounces is now available at Best Buy and RadioShack stores and online at BestBuy.com, Walmart.com and VirginMobileUSA.com for around $150 – without a service contract.